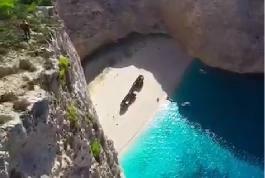 Holiday.gr - Navagio (shipwreck), a trip to a myth! 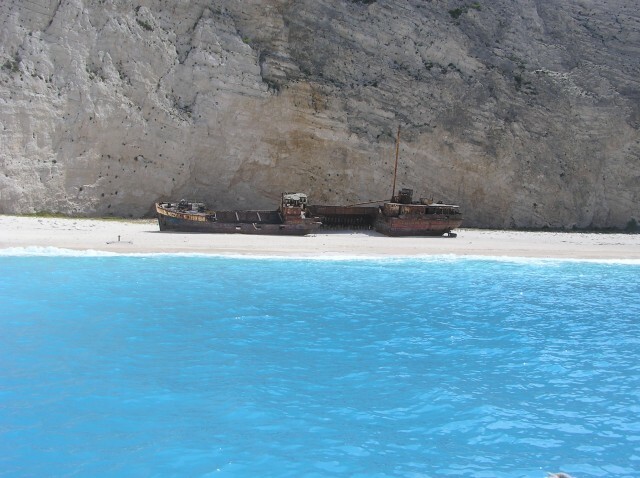 Another worthwhile sight on Zakynthos, which has made the rounds of the island through postcards that represent it on every occasion, is the Navayio (Shipwreck) on its west side. Definitely one of the most famous and the most photographed beaches of Greece. Vertical rocks towering over a rusty shipwreck abandoned in the middle of the beach (it was wrecked in 1983 while it was carrying smuggled cigarettes) with the blue Ionian sea in the background stimulate the imagination and create images from times long past. Before entering this beach, you should leave your car on the flat area and walk towards the cliff. You can also go by the sea taking part in one of the excursions which are organized in Zakynthos or Laganas. There is a boat from the port of St. Nicholas in Volimes or Porto Vromi. Been to Navagio (shipwreck) ? Share your experiences!